One of the ongoing problems in the construction of bridge structures and highway pavements is that engineers must always grapple with the inevitable deterioration of these structures. Bridges and pavements must bear heavy cars and trucks over a sustained period of time. They also face weather conditions, such as rain and snow or extreme heat and cold, that threaten to wear down materials over time. To combat the wear and tear that bridges and highways face, researchers are keen to explore how to build structures that are more durable and longer lasting. One way to approach this problem is through materials science. Materials science is a multidisciplinary approach to the scientific study of the production and use of materials through the lenses of chemistry, physics, and engineering. Breakthrough research in materials science can benefit surface transportation because the innovations developed from this research can be used in construction and repair so that highway bridges and pavements are longer lasting. 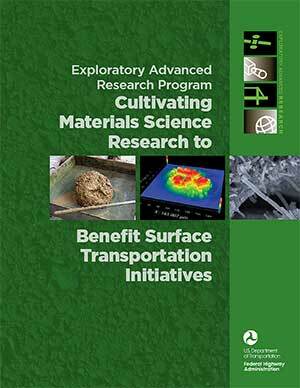 The Federal Highway Administration’s (FHWA’s) Exploratory Advanced Research (EAR) Program actively supports research in materials science as a way to address the health of U.S. highway structures and pavements.